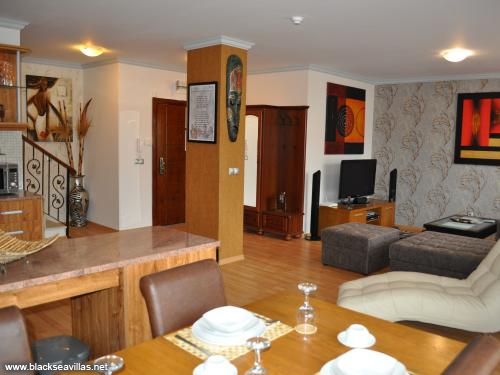 Located in one of the sought after areas of the Bulgarian Black Sea – Golden Sands, this two bedroom penthouse is a spectacular buy. Only few walking minutes from the sea, beach and the Golden Sands coastal promenade, the apartment offers high living quality, stylish furniture and decoration. It is spread out on an area of 193 sq.m shared between the two floors. On the first one there is a spacious open living/lounge area with kitchenette, toilet. The second one comprises of 2 bedrooms and one bathroom. The best feature of this maisonette are the two sunny terraces, one for each of the floors, enabling you and your guest to enjoy your morning coffee at the fresh sea breeze as well as your evening cocktail at sunset. The apartment is sold fully furnished (except personal items), that includes fully equipped kitchen with even a wine refrigerator included. One more extra is the own parking space in the underground garage of the complex. One of a kind offer for your sunny holiday venue! Selling prices of real estates in Bulgaria are in Euro. For your convenience, on our website you can check what the equivalent of the selling price is for the present day in both currencies – USD and GBP. This equivalent is calculated automatically and is bounded with the currency exchange rate for the specific day, therefore it may vary.